The front of the building facing Route 66. Still needs to be trimmed out. The Easter egg garland was a hit - mostly with the "older" girls. Meaning my sister-in-laws. We had fun chit chatting and crafting paper eggs long after the kids bored of the craft. As for my recipes. I made a loaded baked potato salad which was a disappointment. I think I put too much potato and not enough "stuff". I served it cold and wasn't impressed. I've been eating the leftovers. Even heated it's nothing to write home about. Now the Bacon Pops were another story. I had my doubts but I figured with the main ingredients being bacon and cream cheese it couldn't be too bad. The recipe also called for goats cheese which I'd never tried before and I found it added a perfect tang to the dish. Dad's been busy replacing window. Beautiful clean, non-paint gunked windows. Two windows are left and them we're on to the doors!. In a bind for time? I can mail the invites for you. 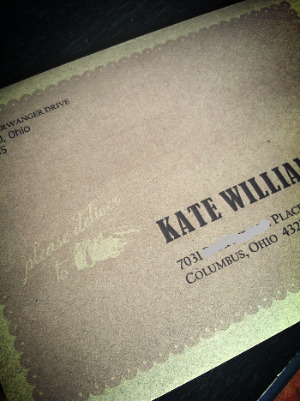 Front of the envelope, Addressed with a little scalloped and hand graphic.